Diamond Charts LLC – Collegiate baseball scouting. Simplified. NCAA spray charts that give your defense the advantage. Let us do the legwork to scout your upcoming opponent's hitters. Every week throughout the season, we provide your program with spray charts for your upcoming opponent’s hitters. 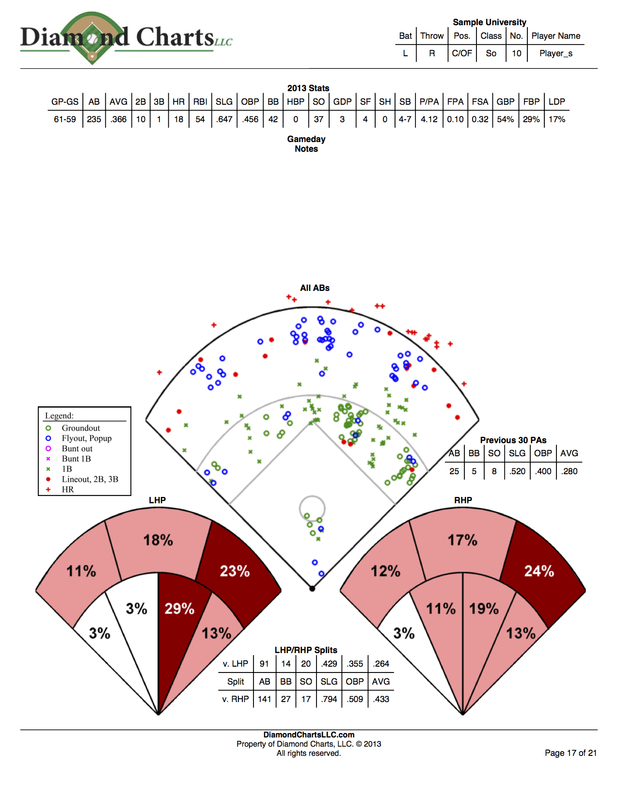 Our reports include detailed spray charts, L/R split sprays, and hitter stats such as P/PA and GB/FB ratios. We have been doing this since 2013 and have been featured by The New York Times. Last season, over half of D1 baseball and softball programs trusted Diamond Charts for their scouting needs. This season, allow us to provide you with that competitive advantage as well. Diamond Charts is the premier spray charts service for the nations top NCAA baseball and softball programs. Diamond Charts provides spray charts for Division I, II and III NCAA Baseball and Softball. "I believe these charts can be very helpful to all programs especially now that college teams cannot go out and scout opponents anymore. These definitely helped us have our players in the right positions to give us the best chance." "Diamond Charts were extremely helpful to myself and our coaches as we prepared for the opponent. Without video footage of each player and team, the spray charts provide a foundation to each player’s spray pattern. It was a tremendous resource to us." "Diamond Charts provided information to help prepare our players/coaches for competition daily. We used Diamond Charts on every opponent we played throughout the playoffs. Would highly recommended Diamond Charts to every program." "We found Diamond Charts to be extremely helpful in developing our defensive game plan and positioning for all of our opponents. The charts and statistics helped to save us a great deal of prep time while allowing us to be more prepared for each opponent that we played. We would highly recommend this product to any serious college baseball program." "We have kept our own spray charts in the past, but were blown away by the quantity and the quality of information we were able to utilize with Diamond Charts. It is a tool we will continue to use indefinitely."